Michigan loves beer. Whether its world-class varieties from craft breweries to the unbeatable traditional brews, you’ve got an array of options. 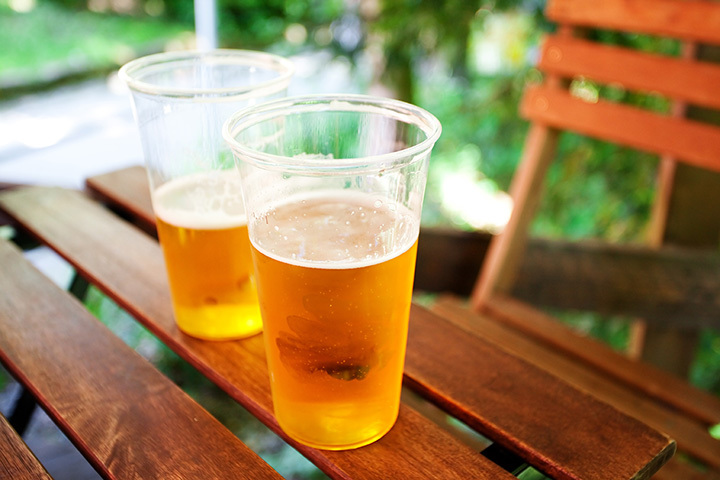 Sometimes, the best way to have beer is in a beer garden, with all the ambiance of a great outdoor setting and plenty of, of course, beer on hand. So with that in mind, come check out 10 of the greatest beer gardens you'll find in Michigan! With a name like “Michigan Beer Company,” you'd expect the beer to be a big deal. You would not be misinformed, as Novi's entry will demonstrate. Over 100 different beers are on hand here, whether on tap or in bottles and cans. The beer garden here is open Thursday, Friday, and Saturday all year round, so whether it's the height of summer or the depths of winter, you can come in and enjoy beer and live music any time. There's more waiting, as Michigan Beer Company also offers a range of food options, including a Michigan treat seldom served in restaurants: venison. Midland's own Larkin Beer Garden looks to bring a taste of summer with it, and can do it readily thanks to plenty of beer in the outdoors. It doesn't just stop at beer, though, because this beer garden not only boasts a set of large picnic tables, but also “life-sized board games” to throw a note of fun into the proceedings. It's also built inside a large shipping container, which makes it a sight to see in its own right. Bring your bikes—take advantage of bike racks—and your dog—they're pet friendly here—and enjoy a full evening of beer and fun. Michigan's Adventure in Muskegon is well-known as Michigan's leading amusement park, yes, but did you know it also has two separate beer gardens in it? The Lakeside Beer Garden, located near the Lakeside Gliders ride, offers simple dining fare from burgers to brats, and a range of beer selections in the traditional beer garden setting. The Surfside Beer Garden, meanwhile, does likewise, near the Slidewinders water slide. So no matter where you are in the park, you'll never be far from a beer garden. Part of the Uncle Ducky's conglomeration in Christmas, the Duck Pond Eatery's beer garden is a comparatively simple affair offering up a wide range of Michigan beers as well as other entries into the brewer's art. That's just part of what's on hand here; the Eatery itself offers plenty of dishes from barbecue favorites, and immediately nearby, kayaking, camping, and a cruise around Grand Island is also on tap, complete with a sunset dinner cruise that promises great meals and great views. Beer gardens can be found all over Michigan, and Petoskey is no exception. The Back Lot is a comparatively new addition to the field, and offers both attractions and architectural treasures to keep visitors entertained. Check out the barn wood that makes up the Main Bar, backed up by aged steel and marble. Four hundred feet of glass garage doors add a wonderful taste of the outdoors to the indoors, and whether you're there for a quiet drink or a taste of the ball game, you'll have just about everything you could ask for here. Grand Rapids is home to the Sovengard—a great spot for having beer and gathering with friends. Start with a range of beer options, in draft, bottle and can—the menu actually changes fairly frequently, so be sure to check back to make sure your favorites are still on hand—and finish up with an equally wide range of food options as well. “Bier Garten” is actually the true and authentic way to spell “beer garden” from the original German. So when you come to Bay City for Bier Garten Food and Wet Goods, you'll see plenty of authenticity out here. Great for big groups and plenty of outdoor seating, Bier Garten features 16 beers on tap and another 10 in bottles and cans, so you'll have plenty of options here. There's even a notification system that emails you when new arrivals hit, so you always know when to plan a trip to the Bier Garten. Traverse City, once again, proves that it's home to just about anything you could want in Michigan by offering the Shed Beer Garden. The Shed offers a wide range of options in food and drink—how do you feel about four different sliders? Banana pudding? Yeah, thought so—but more is waiting beyond. Check out the firepit and branded beanbag toss boards, as well as regular bouts of live music, for not only beer but fun besides! Head to Sutton's Bay for HopLot Brewing Company, with a beer garden that looks like a bit of Northern Michigan should look. Heavy on the trees, this beer garden will go for natural splendor on a level you may not have thought possible beforehand. Complete with campfires and corn-hole (a Michigan favorite game akin to a bean bag toss), this three-quarter acre beer garden will deliver on virtually every front. Kalamazoo's HopCat—there are actually a couple other locations too—features live music every Friday and Saturday night from six to nine at night. You'll get some great views and exciting music being outside, but that's not where it stops. Check out the Local 30, a range of area-produced favorites, as well as wheats, IPAs and more. That's before we even get to the food, and HopCat won't disappoint there either.